A side view. 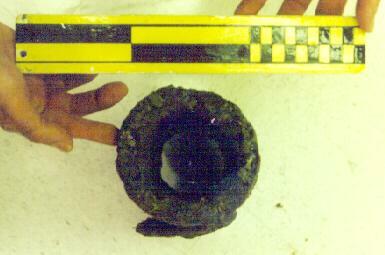 The scale is 30cm (1 foot) long. An end-on view of the section of wheel frame. Diagram showing (in red) the original location of the piece. 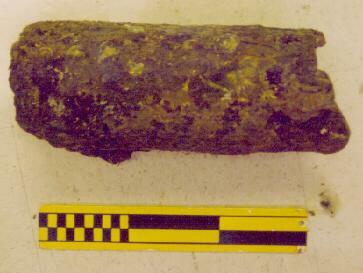 In October 1998 the Denbigh Project team recovered two artifacts from the wreck site. The first, above, is part of the iron sidewheel sidewheel frame, including the circular socket which holds the pin on which the paddles, or "floats," pivot as the wheel goes around. A Parson's superheater, believed to be similar to that installed aboard Denbigh. 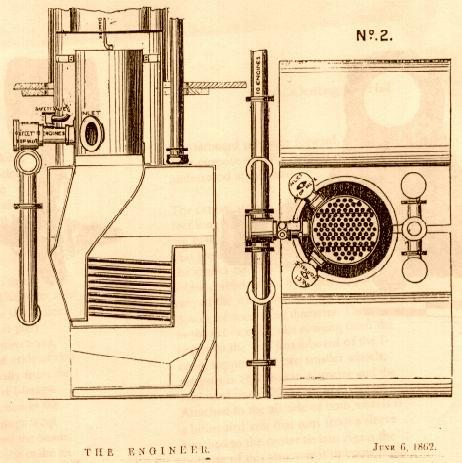 From The Engineer, June 1862. 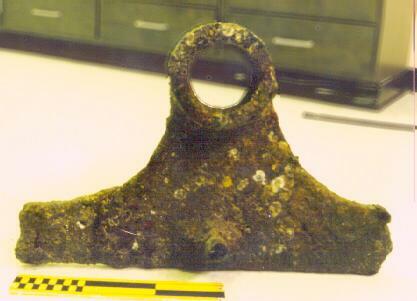 The second artifact is a broken piece of tubing from what the investigators believe is the ship's superheater, a device that adds additional heat to the steam in the boiler, making more efficient use of the fuel consumed. Superheating equipment was just becoming commonplace in 1860, and Denbigh was probably one of relatively few coastal steamers so outfitted. 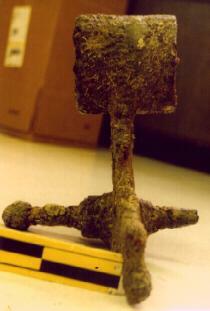 Both the artifacts are currently undergoing analyses for their composition and structure.